I’m here tonight to talk about The Power by Naomi Alderman. This was one of the books I received as a gift for Christmas (I actually got it because my fiancé got it for my sister and when he was telling me about it, I got so interested in it I pouted a little bit because he didn’t get one for me… well surprise!) and it was the one I was most excited to read. 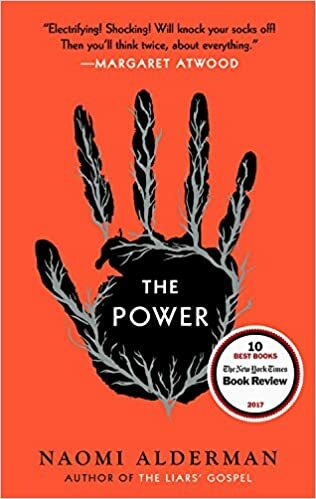 The minute I finished my book that I carried over from 2017, I immediately moved on to The Power, and let me tell you, I can see why Barack Obama put this novel as number one of his favorite books of 2017 list. The Power is getting a lot of notice for being this generation’s The Handmaid’s Tale, Margaret Atwood’s 1985 feminist work. And the hype is deserved. It is a piece of feminist literature that makes one feel all of the emotions, from empowered, to terrified, to enlightened. The novel, just like it’s female characters, are a force to be reckoned with. Alderman’s novel follows four central characters as teenage girls suddenly discover that they have the power to shoot electricity from their fingers – enough to cause terrible pain, and even death. There is Roxy, the daughter of a crime boss in London. Tunde, a Nigerian young man who documents the revolutions happening across the world. Margot, an ambitious U.S politician who struggles to control her powers. And Allie, an abused young woman finds the call to be the Goddesses voice here on Earth. Throughout the novel, we watch as the world learns what it can be like when women become the superior gender. We find that it does not become a utopia where women and men learn to live together as equals, instead we find a dystopian future where violence and cruelty reign as one gender learns what power can do and as the other struggles to cope with the loss of their long standing dominance. “It doesn’t matter that she shouldn’t, that she never would. What matters is that she could if she wanted. The power to hurt is a kind of wealth.” – The Power, Naomi Alderman. The thought that was left in my mind for days after finishing this novel was that, we know that with great power comes great responsibility, (thank you Uncle Ben) but is the world the way that it is because of who is in power, or is it power itself that causes the world to become the way that it is?